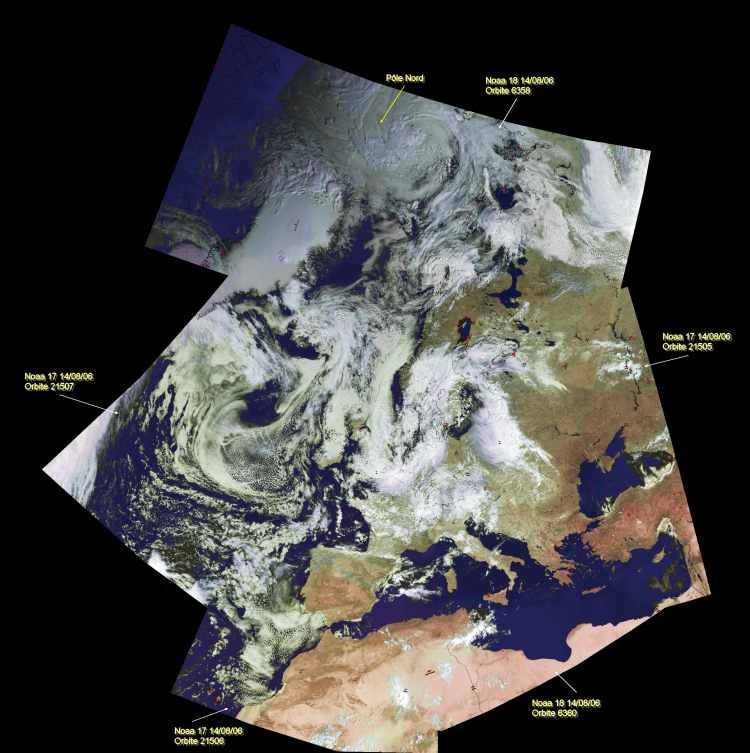 The AVHRR Manager is a program to assist with the reception and management of NOAA-19 and Metop-A/B AVHRR data being sent over EUMETCast as part of the EUMETSAT EARS AVHRR service. Here is a Google Earth KMZ file showing the locations of the EUMETSAT ground stations (updates welcomed!). The AVHRR Manager is but one component of an HRPT software set, and how you expand it is up you and your particular needs. The composite output produced by the program is in a standard format, allowing viewing by software like my HRPT Reader. The HRPT Reader allows you to view different combinations of the five data channels, and provides both attractive images and scientifically useful data. The temperature display is calibrated, and multiple country-boundary overlays can be added. There is a free version of the HRPT Reader, as well as a registered version which supports more functions and allows fully automated operation from the command-line. The HRPT Reader can share its Kepler data with the AVHRR Manager. Should you wish to to reproject the output from the HRPT Reader into standard map projections, so that it can be combined with other data sources in a Geographical Information System (GIS), you can use my Ground Map program. By using a common map projection, data from many sources can be brought together, providing a much more complete picture of the prevailing atmospheric conditions. Current Kepler data is required by the AVHRR Manager, and you can get that data easily. My WXtrack program provides an easy way for you to retrieve Kepler data and gives a very attractive display of the locations of multiple satellites including the ISS. However, for displaying passes more than a week or two old, you need Kepler data which is contemporary with the pass, and therefore you need historical Kepler data. 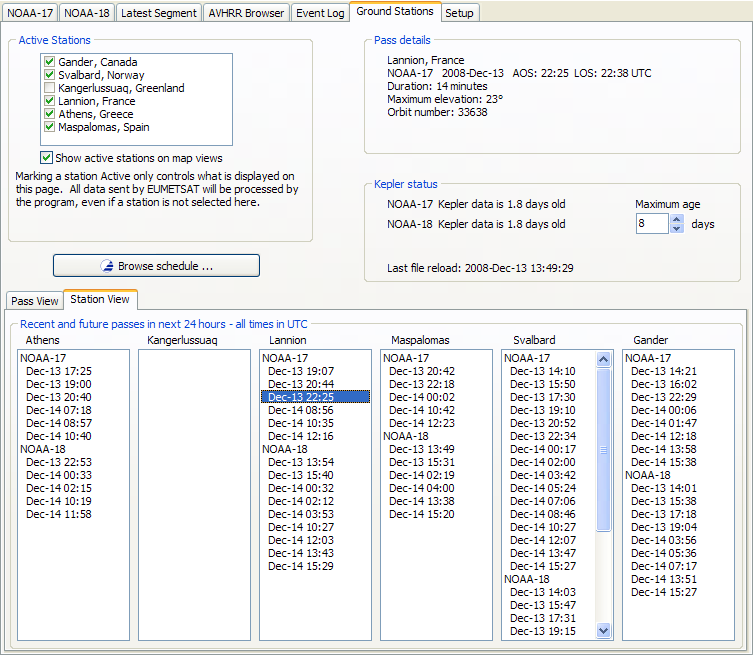 The registered version of my WXtrack program allows the use of the registered version of my Kepler Manager software, which allows fully-automated management of Kepler data, downloading it from the Space-Track Web site, and updating a local copy of the multi-entry historical Kepler data required by both the HRPT Reader and the AVHRR Manager. As you may wish to purchase more than just the AVHRR Manager, I do also offer a package of the five programs mentioned above called the HRPT Toolset suite, providing you a substantial discount. There is also HRPT Toolset Plus suite which includes the Metop Manager for EPS data as well. Screen-shot when running the AVHRR Manager with NOAA-17 data from 2006 August 23. This shows a composite pass from combining three stations, one being south (Maspalomas in the Canary Islands), one in northern France (Lannion), and the other being north (Svalbard). The location of the active stations is shown by antenna symbols. New stations in Greenland and Athens have since been added to the network. The full output from the program is a strip of width 2048 pixels and (in this case) 10080 pixels high. When processed, the output image is typically 2600 pixels wide, with a central resolution of 1km. During a pass, the latest received segment (a strip 300 lines high and 2048 pixels wide) can be displayed on the View latest segment tab, as shown below. 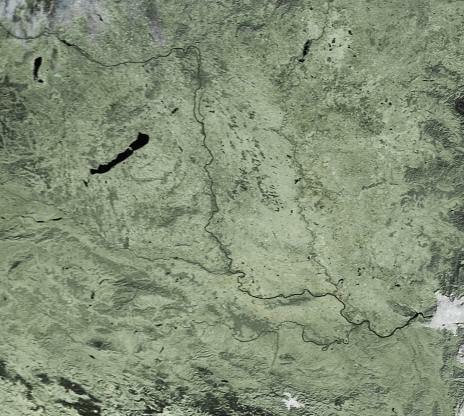 In this example, Lake Geneva, Lake Neuch�tel and Lake Constance in Switzerland are clearly visible, as is Lake Garda in Italy. 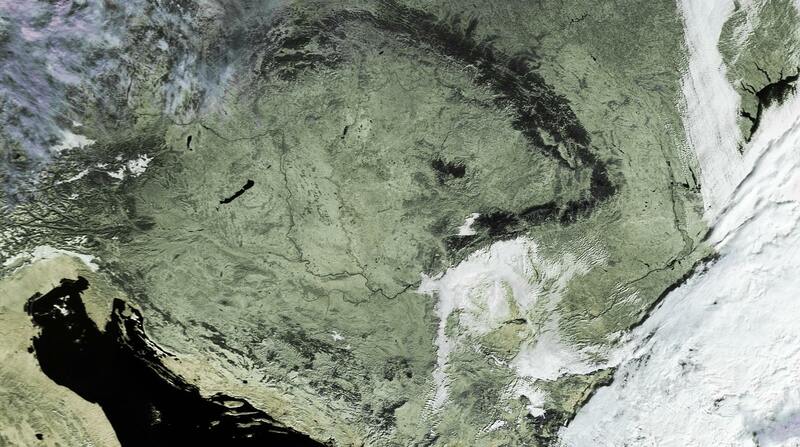 The Alps occupy the centre of the image, and the north of the Adriatic Sea and Istria are visible to the right. From more recent data (2006 Oct 31), here is a false-colour image from NOAA-17 received through the AVHRR Manager, and subsequently processed by my HRPT Reader software. I have used a combination of channel 3 (near-IR 1.6�m) and the main thermal channel (4, 10�m) which brings out the river Danube very well. Click the image for a larger area coverage image. Here is the Ground Stations display in action. You can select which ground stations are active, and browse the EUMETSAT pass schedule. For each station, a list of passes is shown, and you can click on a pass for more details. Here, I have clicked on the 22:55 NOAA-17 pass at Lannion and the details are shown in the top right panel. There is a panel where you can check the age of the Kepler data the program is using. I suggest you don't allow it to be more than a few days out of date, and you can set the threshold for the maximum allowed age here. The program works with NOAA-19 & Metop-A/B AVHRR data sent over the EUMETCast data stream. You need to register with EUMETSAT (free) to receive this data. The program requires Kepler data, such as that from the CelesTrak and Space-Track Web sites, and if you have my Kepler Manager you can automate the downloading of this data. I suggest that you install either the HRPT Reader or WXtrack to help understand obtaining and using Kepler data if this is new to you. To view the output from the program, you require a viewer program such as my HRPT Reader (free version available). A screen resolution of 1024 x 768 may be required to operate this software. The program is supported on Windows-7 and later, 32- and 64-bit versions, and it should work on Windows server equivalents (but has not been tested by me). Earlier versions of Windows may also work but are no longer supported. For data capture alone, a 500 MHz PC with 512 MB of memory is the minimum requirement. For processing the resulting files, a 1 GHz or faster PC with 512 MB or more of memory is recommended. Be aware that the processed files, even with just the one EUMETSAT HRPT station current in the trials phase, can produce about 1 GB of data per day. You will need to size your disk accordingly. A good, fast disk with a 16 MB or 32 MB buffer is recommended. Guidelines on publishing EUMETSAT data. Some Windows 8.1 systems appear to make the AVHRR Manager unresponsive after a period of operation. If this affects you, there is an unsupported AVHRR Watcher program you can download here. There are six tabs in the main program display, and a single start/stop button. You should first visit the Setup tab, and configure the program to match the paths for data in your own system. Once this is done, and you are receiving data, the output files should be named like: 2006-03-16_1024_noaa17_19357.raw16, and you can double-click these files, and ask Windows to open them with the HRPT Reader software. The map view provides a quick visual check on the incoming data. You can follow the progress segment by segment. Each segment lasts one minute, and will appear as a curved strip on the polar stereographic map projection used. The colours are a simple false-colour combination of two visible and one infra-red channels, designed to provide a display under both day and night conditions. The is provides a quick-look at the last one-minute segment which has been processed by the program. As the image is only 300 pixels high, it will not occupy the full screen height, but as it is 2048 pixels wide, a scroll bar is provided to allow examination of the full image. 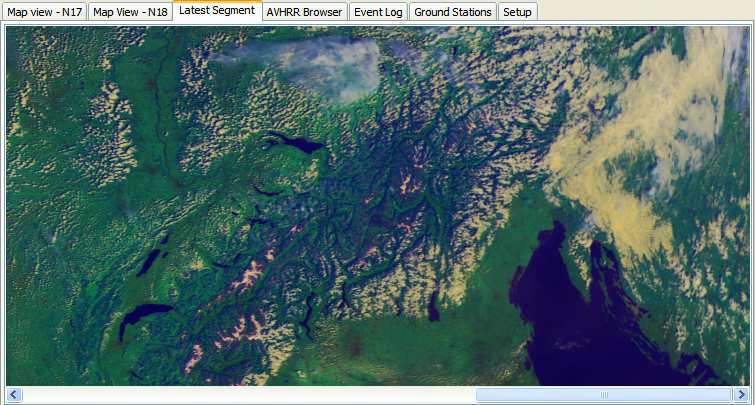 Provides an explorer-like view into the available thumbnail image and composite AVHRR data. A single button-click will display data for today. Clicking on an image thumbnail file will display the thumbnail in a small panel so that the pass location can be seen. The composite AVHRR file matching the thumbnail can be opened with a button-click, or by clicking the .hpt file. Please note that the HRPT Reader must be installed on the PC for the open .hpt file function to work. A function is provided to delete the AVHRR data and thumbnail image from unwanted passes (such as ones outside your region of interest, or perhaps overnight passes). You can examine a log of the received segments on this tab. The delay between segment capture time and reception time is shown. A pass prediction for next 24 hours for each selected station is displayed in the lower part of this tab. The stations tab allows you to tell the program which ground stations are currently active, and whether those ground stations should be displayed on the Map View. This does not affect the data received, just the display. A list of passes expected at each ground station is displayed, and details of a particular pass can be obtained by clicking on the pass. The status of the Kepler data is shown - the age of the Keplers for each satellite - and the last time that multi-satellite Kepler data was reloaded. There is a pop-up hint on each Kepler age showing the data source. The setup tab allows you to match the program's data paths to those of your system, and to customise a number of options. You can define the path to the Kepler data (and the Auto button can help you), the path to the TelliCast received files (probably the same as the "Received files location" in the MSG Data Manager, and the path to the combined files. These combined files can be viewed with the HRPT Reader. You can set how many days the combined files will be kept. This enables you very easily to control the disk space used by the program. You can choose to store the combined files in dated folders, for ease of organisation. You can choose the path to store the segment files, if you enable this option. You can have the program delete the raw data (this should normally be enabled). You can choose if the program should delete other non-AVHRR channel 1 data. You can have the program announce events like the start of a new scan, and the arrival of a new segment. Please use the Windows, Control Panel, Sounds applet to define the actual sounds. Important: having up-to-date Kepler information is vital to the working of the AVHRR Manager software. If you are at all unfamiliar with this aspect of using satellites, at the very least follow step 1 below before installing and trying to use the AVHRR Manager. Download and install WXtrack, and get that program working. Find out about updating the Kepler data from the Internet, as you will need reasonably fresh Kepler data to run the AVHRR Manager. Install the current HRPT Reader, and become familiar with providing that program with the multi-entry Kepler data. Whilst the mixed Kepler data from the CelesTrak Web site http://celestrak.com/NORAD/elements/noaa.txt is sufficient for satellite data near in time to the Kepler data, if you want to process older data (such as the AVHRR data from the EUMETSAT archive), having the multiple-entry Kepler data which includes data back to when the satellite was launched is a good idea. You can use either the registered version of my Kepler Manager or perhaps the CelesTrak TLE Retriever to keep your multiple-entry Keplers up-to-date. If you have questions about the program, they may already be answered in the general FAQs or the AVHRR FAQs. V4.0.2 Add Edmonton station, allow Edmonton to be unselected, list stations in alphabetical order (were by latitude), minor changes to Ground Stations tab layout. Important: this program has built-in 30-day trial licence. If you just want to try the program, please do not run the program until you know you are receiving the EUMETCast data! Once the trial 30-day period has started, there is no way to reset it. Depending on your needs, you can register either the AVHRR Manager alone, and use your existing software for post-processing the data, or you can get a package of well-known programs which will turn the data into images, allow geographic map projection of the images, and automatically keep your Kepler data current. AVHRR Manager alone - you can register the program online here. You can also get AVHRR Manager as part of the HRPT Toolset Plus suite, which includes the HRPT Reader, Ground Map, the Kepler Manager, WXtrack and the Metop Manager for whole-world, one orbit delayed, EPS data as well. This is a substantial saving compared to the individual programs! I was delighted to receive the image below from G�rard Kruger as an example of what can be done with programs from the HRPT Toolset. 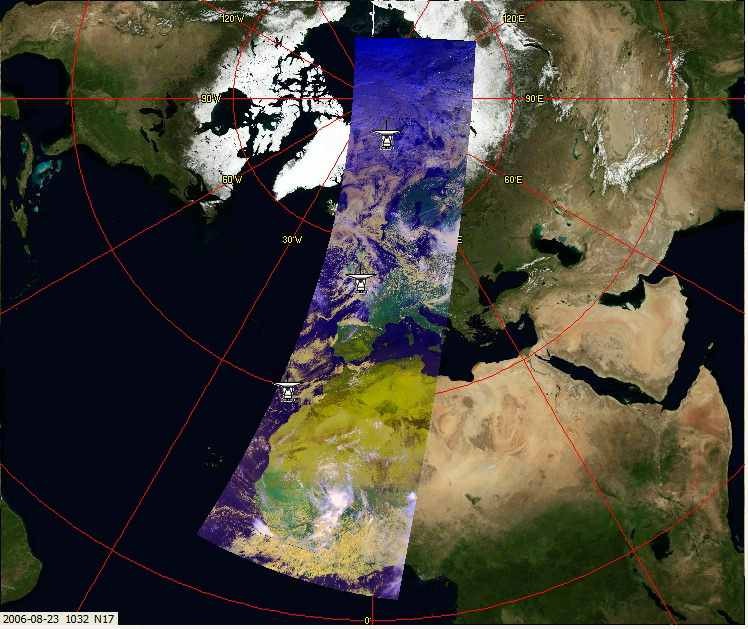 Here, G�rard has used the AVHRR Manager to capture the data, the HRPT Reader to process the data from multiple satellite channels into a false-colour image, and GroundMap to rectify the images into a common map projection. He has combined the data from five satellite passes to produce a stunning image which covers from Africa to beyond the North Pole. Many thanks, G�rard, and to EUMETSAT and NOAA for making this possible. You can click the image to the full resolution image (about 500KB).